James Hornsby will lead Samford University’s undergraduate student body as the newly elected president for 2018-19. He will be joined by three executive elected officers, five other appointed officers and nine elected class officers. Hornsby is a rising senior finance major. He served this past year as vice president for senate. As president, he will represent the undergraduate student body with the university administration and will provide leadership to SGA. Heath Padgett, vice president for senate. Padgett is a sophomore biology major from Birmingham. The senate allocates campus life fees to student organizations and voices student concerns to the university administration. Cameron Dobbins, vice president for events. Dobbins is a junior marketing major from Cordova, Tennessee, and will provide leadership for the Student Activities Council. Angel Sims, vice president for development. Sims is a sophomore psychology major from Chattanooga, Tennessee, and will oversee the Freshman Forum leadership group and work with class officers. Emma Paine, chief justice. Paine is a junior psychology major from Florence, Alabama. Brittany Morgan, chief of staff. Morgan is a junior sports medicine major from Birmingham. Sarah Borozan, press secretary. Borozan is a junior interior design major from Marietta, Georgia. Evans Head, treasurer. Head is a senior accounting major from Vestavia Hills, Alabama. Lucy Kate Green, chaplain. Green is a junior communication studies major from Gainesville, Georgia. John Collier, a public administration major from Birmingham, senior class president; Macy Marin, a journalism and mass communication major from Tullahoma, Tennessee, senior class vice president; and Lynsey Smith, a law, politics and society major from Hendersonville, Tennessee, senior class secretary/treasurer. Ashton Holliday, a sports medicine major from Marshall, Texas, junior class president; Sammy Solberg, a graphic design major from Longwood, Florida, junior class vice president; and Sara Asmann, a journalism and mass communication major from Augusta, Georgia, junior class secretary/treasurer. Hope Dawson, a journalism and mass communication major from Birmingham, sophomore class president; Drew Fillinger, a musical theatre major from Vinemont, Alabama, sophomore class vice president; and Jenny Chin-Lai, a pre-business major from Hoover, Alabama, sophomore class secretary/treasurer. Freshmen class officers and representatives will be elected in September. 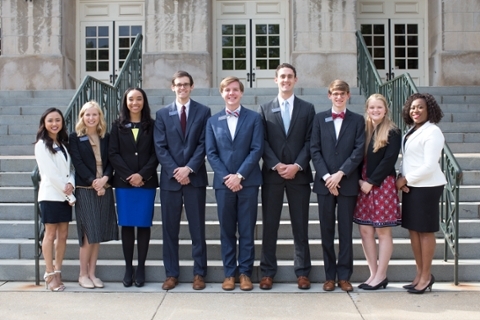 In addition, 33 students were elected to the SGA Senate, and 12 students were named to the Student Judiciary Council (SJC).